The Big E is a huge deal in New England. All 8 New England states come together for three weeks in September and show off the best they have to offer in agriculture, food, and livestock. It was a big day for me. Oh, and it also happened to be my 25th birthday! 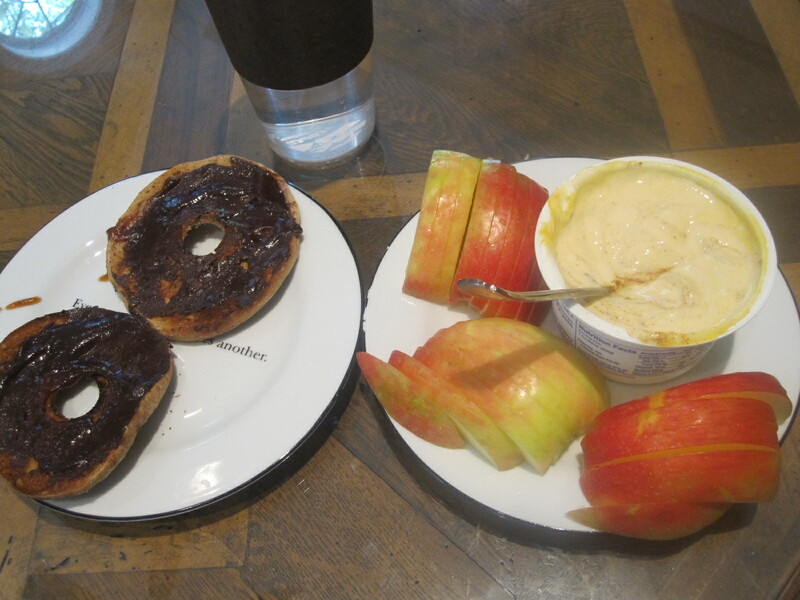 After a pretty good 20 minute Vinyasa Flow from yogadownload.com, as well as a 40 minute elliptical training session, I quickly ate a Bagel Thin smeared with Maranatha Dark Chocolate Almond Butter and Apple Butter, as well as a huge Honeycrisp and some pumpkin yogurt (1 tbsp pumpkin mixed with Fage 2% Greek Yogurt). I was seriously considering having a Cider Donut as they were sitting on my counter, but my stomach wasn’t being nice so I ended up nixing it. This was perfect, as it kept me full until around 1:30 when we got to the Big E! I was really only looking for one option for lunch: The chicken pita! There’s a place that does the best ones, but after searching for a few minutes, I couldn’t find it. Thankfully, there was another place that solely did pitas, so I got an approximate version to what I had enjoyed last year. 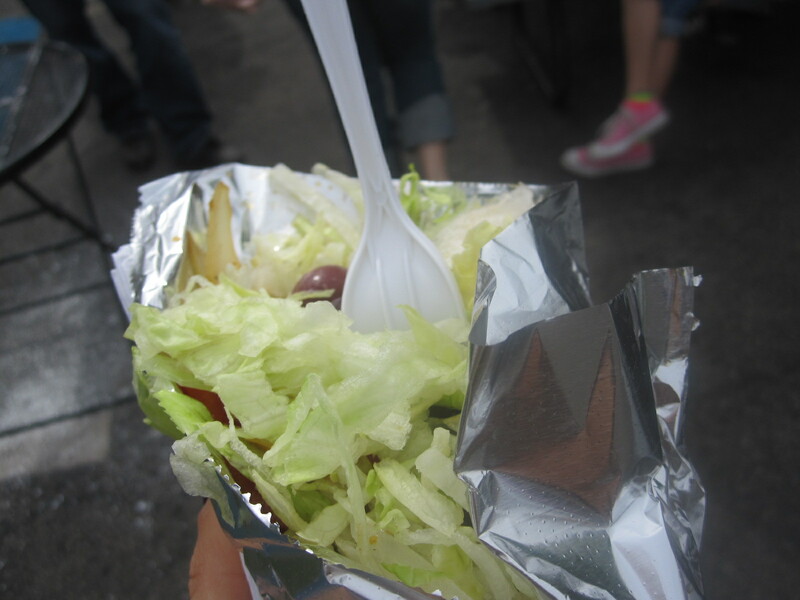 I had my pita plain, with chicken, onion, kalamata olives, and lettuce. Delicious, and filling. So filling, I didn’t even have room for anything else! Also it should be known that about ten minutes after finishing this pita, I found the original place from last year! Bummer. 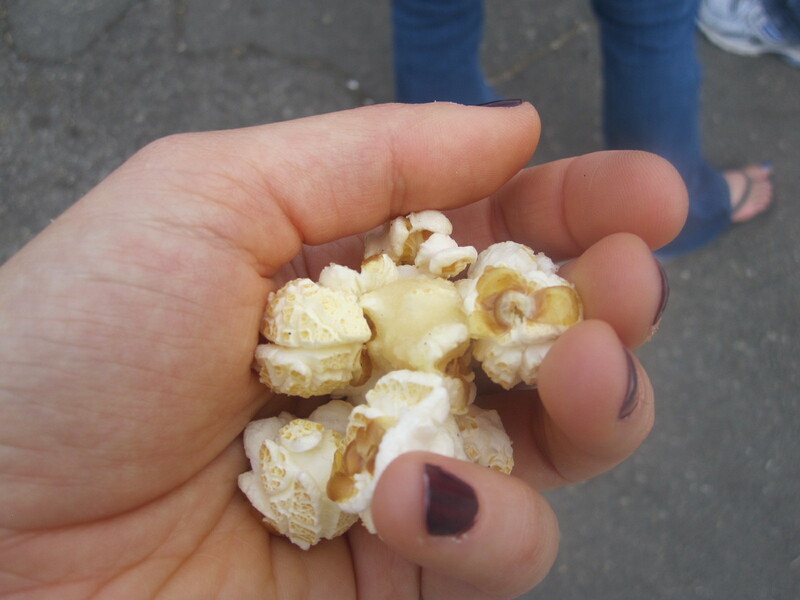 Despite filling up on that pita, I managed to enjoy a handful or two of kettle corn, as well as a few bites of cider doughnut and apple cider. The apple cider was particularly refreshing in one building that was stiflingly hot! 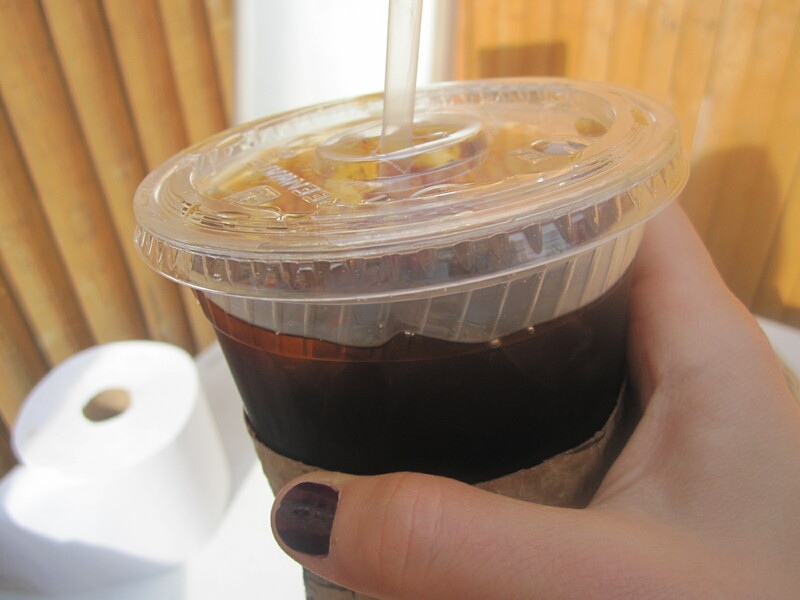 Later on as our visit wound down, I grabbed an iced coffee. I was actually pretty proud of myself. Last year I ate so much at the Big E I got sick. And it’s so easy to do. There’s fried butter and fried Jelly Beans, for God’s sake. However, I wasn’t restricting. I nibbled when I wanted to, and didn’t overdo it. Plus, I knew I’d be having a big dinner, so I wanted to save room. In short, I left the Big E satisfied, but not stuffed to the gills and in pain. 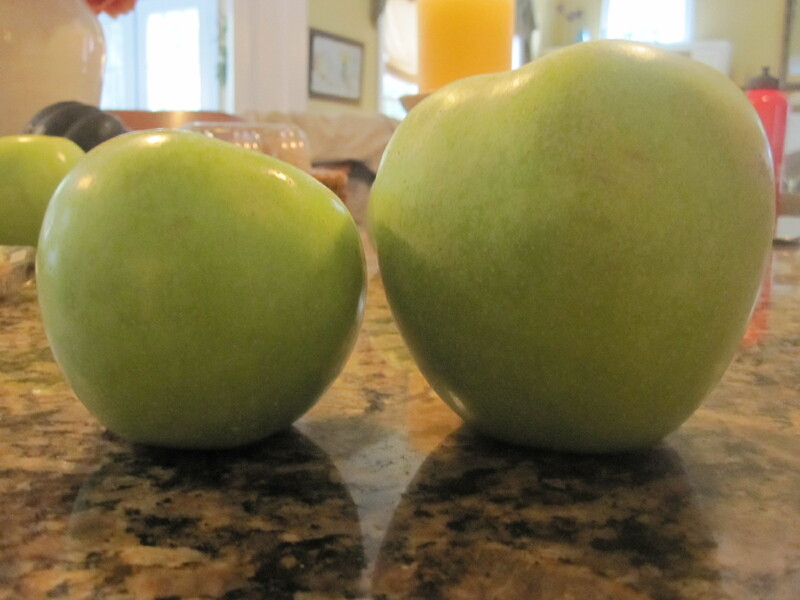 Once I got home, I greeted my mom, who showed me the ‘steroid’ apples she had gotten from my grandmother on her weekend trip to Philadelphia. This apple was SO big! I need it in my life for tomorrow morning! After cleaning my room for a little bit (hey, can’t slack on chores just ‘cuz it’s my birthday!) I dug into my dinner: Chinese food. I know, it’s a little weird that my mom decided to order Chinese food on my birthday, but my brother’s birthday is in a week and that’s when my Dad gets home from a business trip, so we’re having a big double birthday dinner then! 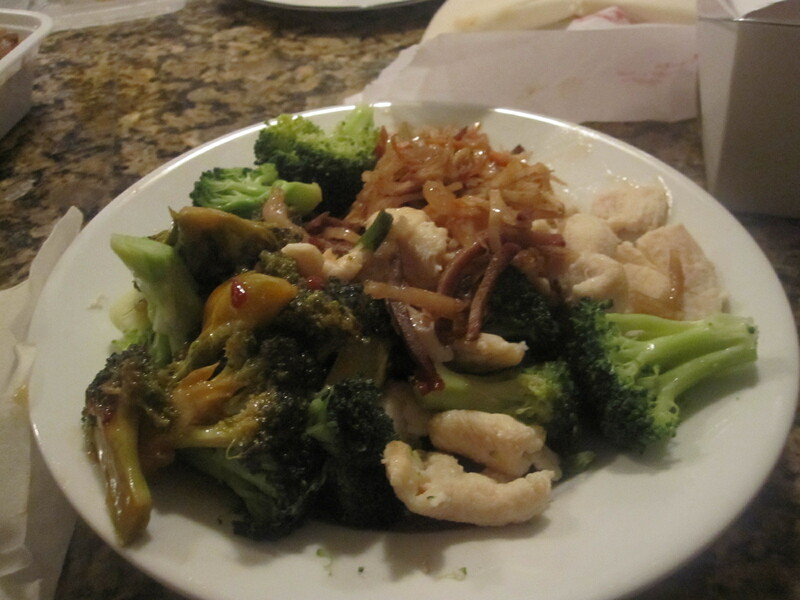 I had a big plate of steamed chicken, steamed and garlic broccoli, a teeny bit of mushu pork w/ pancake, and a bite of pork fried rice. I must say, I really love Chinese food. I wish I could have it once a week. After my sister, her husband, and their baby came over, I enjoyed Shady Glen ice cream! You may remember I reviewed their famous Bernice Burger about a month ago. Well, now I can say I’ve had their apple pie sundae! I didn’t know you could have the apple pie sundae with any of their ice cream flavors, but I wanted it with Apple Strudel so that’s what I got! 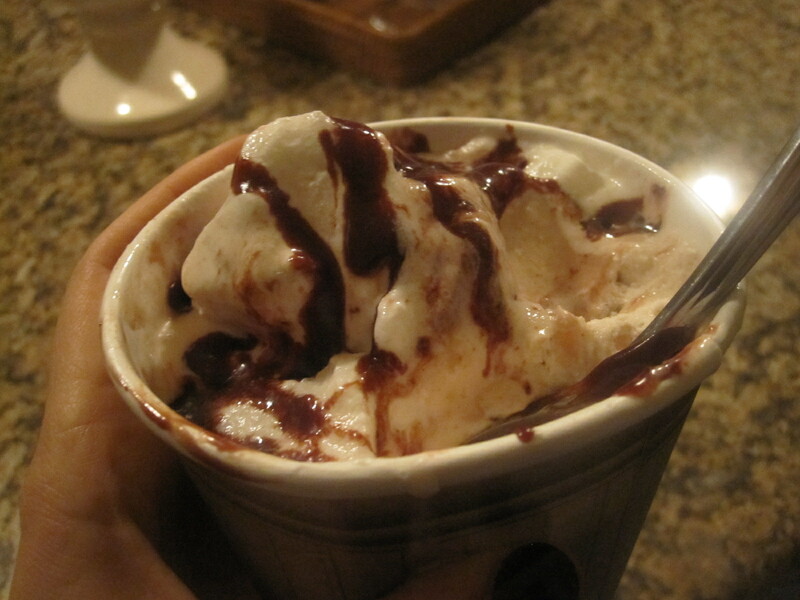 I added the hot fudge sauce. This was so divine!!! Thick, sweet, with chunks of apple mixed in. Absolutely delicious and perfect for a birthday dessert. Sadly, no candles. But maybe for my brother and I for our joint birthday dinner? I must confess, the party didn’t stop there. I also split a Big E Cream Puff with my sister, and enjoyed a few bites of apple crisp as well as a few small cookies. Now, I’m laying here, tired but content, and trying to raise up the energy finish up this entry. Today was my first entirely coffee-free day in weeks, so no wonder it’s hard to keep my eyes open! I hope all of you had a great Sunday. Did you know it’s National Pancake Day? I had no idea!